When the Greek historian Herodotus visited Egypt nearly 2500 years ago, he wrote an account of watching what he regarded as unusual Nile river-boats being built. But since ancient times no trace of the sort of vessel he described had ever been found – until now. A Nile barge or “baris”, constructed almost exactly as the historian described, is one of more than 70 wrecks to have been revealed in the world’s largest graveyard of ancient ships, dating from the 8th to the 2nd century BC. Discovered in the sunken port-city of Thonis-Heracleion in Egypt’s Aboukir Bay, into which the Nile flows, the vessels are undergoing long-term excavation by underwater archaeologist Franck Goddio’s European Institute for Underwater Archaeology. Oxford University’s Centre for Maritime Archaeology has also been involved in the work and one of its divers, Alexander Belov, has just published a book about the baris. Herodotus described it so accurately in 450 BC that Belov suspects that he might have been reporting from the very shipyard where the find was built. 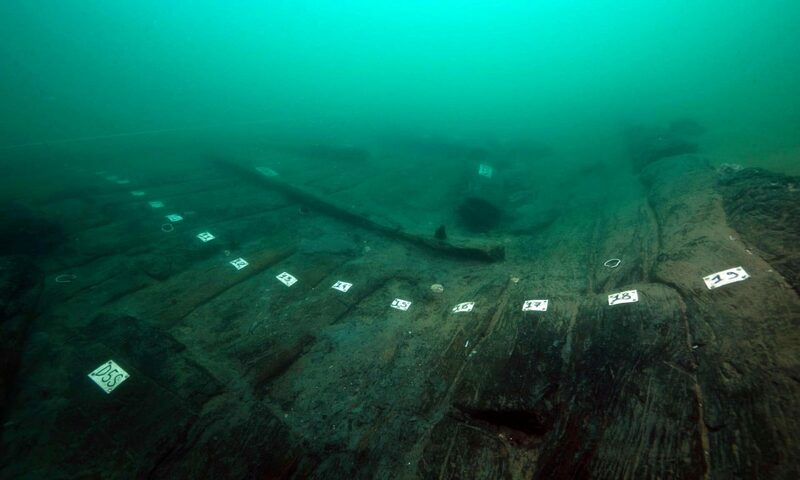 The 28m vessel had been well preserved under the silt, and the excavation work has revealed a crescent-shaped timber hull, about 70% of which has survived. Its acacia-wood planks are cut to lengths of about 1m and instead of being jointed are held together by ribs up to 2m long, fastened using pegs. Papyrus was used to make the seams watertight, and also to make the sails. The mast was made from acacia and a single axial rudder passed through a hole in the keel. Almost every detail in the Herodotus text corresponds exactly, according to Belov, although the wreck is slightly smaller than the example described. Belov has been diving with Goddio for 20 years, and was hooked early in 1999 while working under water in poor visibility. As he cleaned what he thought was a rock, the head of a sphinx emerged from the concretion. “It was very exciting!” he says – though the baris, as the first large Egyptian trading boat ever to be discovered, is likely to prove more archaeologically significant. Belov’s book “Ship 17 – a Baris from Thonis-Heracleion” describes how the vessel would have been used on the Nile – and recycled afterwards by being built into the marine structure of the port.